TELL ME. What are monofilament wigs? A wig made with a Monofilament top cap allows for personal, multidirectional styling to give you the perfect illusion of natural hair. The durable and realistic hair-like fibre strands are individually hand tied in to a virtually transparent cap which actually bears the colour of the scalp of the wearer adding to the fantastic naturalistic look. This technique allows each strand of hair to move freely as would real, natural hair. The cap eliminates the heat and moisture on the head whilst allowing your skin to breathe through daily wear. WHO? Who is this product perfect for? Anyone! Anyone who wants a natural yet glamorous look with freedom of style. However, this type of wig is perfect for those with sensitive scalps or those at any stage of hair loss due to the delicate materials used and the technique in which each individual wig is made. 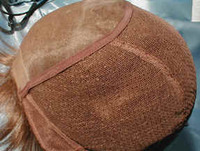 As mentioned above, the virtually transparent cap allows the scalp to breathe, eliminating moisture and discomfort. A good question, but a simple answer. These wigs are premium quality and they take takes weeks of intricate work and care to create individually, for you. Unlike standard wigs that remain in the manufactured style, the mono top cap wig gives you the freedom to easily create your desired style with a lighter, comfortable and more natural feel. MORE? Want to see these styles for yourself? See below for snapshots of our gorgeous collection of mono top cap wigs. Don't panic! - They come in many natural, multi-tonal shades which will suit any skin tone! Just visit http://www.celebwigs.com/monofilament-top-wigs/ to find out more about our stunning monofilament wigs range.